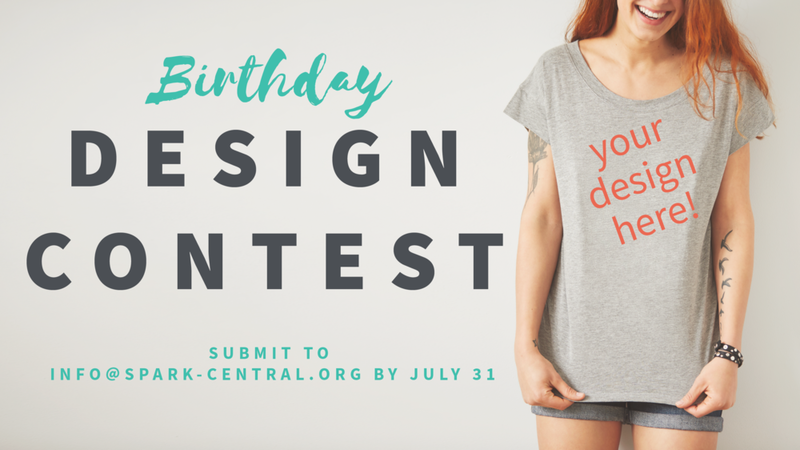 Spark Central invites artists, doodlers, dreamers and designers to participate in our contest to design a new suite of Spark Central T-shirts! Submissions will be accepted at info@spark-central.org through July 31st, after which one design will be selected for T-shirts to be made in August. Entrants must provide their name and email address or phone number. The entrant whose design is chosen will receive a free T-shirt with the design they submitted, while two honorable mentions will be shared with the community. To be considered, submissions must relate thematically to "Creativity," "Imagination" or "Innovation." Designers may choose to incorporate one of these words into their designs. Submissions should be appropriate for all ages. Designs that use clean, clear lines will be given priority in consideration of submissions. Entrants should limit the size of their design to 8.5" x 11". Designs may include color or be black and white.